I didn’t think I was going to get a post up this weekend; It has been such a crazy week here! I started working again, Wolfie started daycare, and well, life. I’m still adjusting to my new schedule and it feels like I’m running around all crazy like and getting nothing done. I’ve also decided to give up caffeine, so that doesn’t help! But, here we are, 6am, the family is still sleeping, and I’m writing a post just in time for your Christmas dinner. I actually brought this to Thanksgiving this year, and it was delicious! I have told you I go to a meat-eating Thanksgiving so I like to bring an entire vegan meal in one dish. This had potatoes, roasted vegetables, gravy, a hearty “main” component, and a light and fluffy bread. It was just all layered together so it could be re-heated in a small portion of the oven, and I could bring everything with my in a very full car. With this dish the only other things you need to bring are dessert, and cranberry orange relish. Your holiday is complete. You’re welcome. 1/2 batch vegan gravy without the mushrooms. 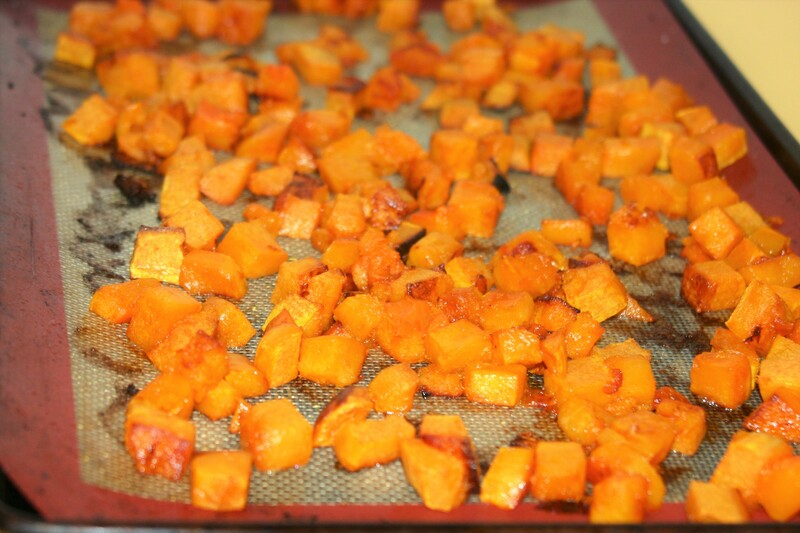 Place your squash in one layer on a large baking sheet (I like to put a silicone mat down first). Drizzle 2 TBL oil over squash, sprinkle with salt, and give it a stir. Cook, stirring every 15 minutes until the squash is soft, and starting to brown, about 45 minutes. Pour in the oil, heating it for a few seconds, then add the portabella mushrooms and saute, stirring occasionally until tender, about 5 minutes. Get all your pre-made everything and set it out for easy access. 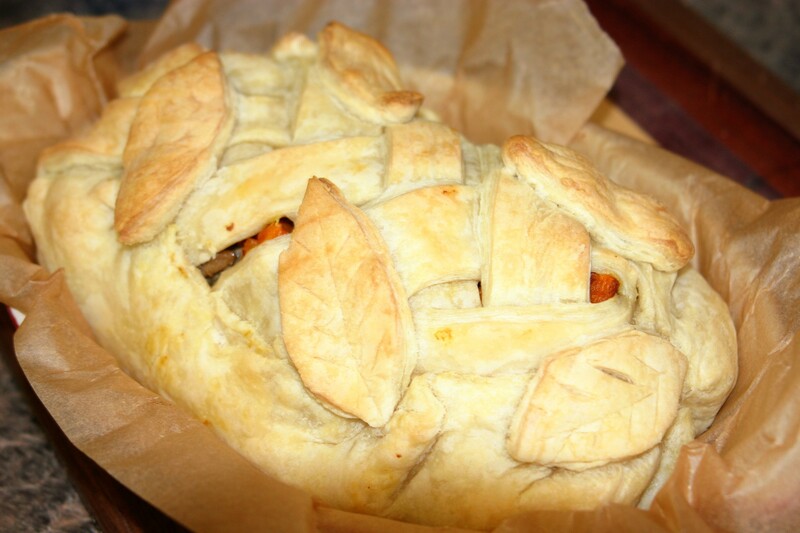 Place one sheet of puff pastry in the bottom of your baking dish. Cut a rectangle out of the scalloped potatoes just smaller than the puff pastry. 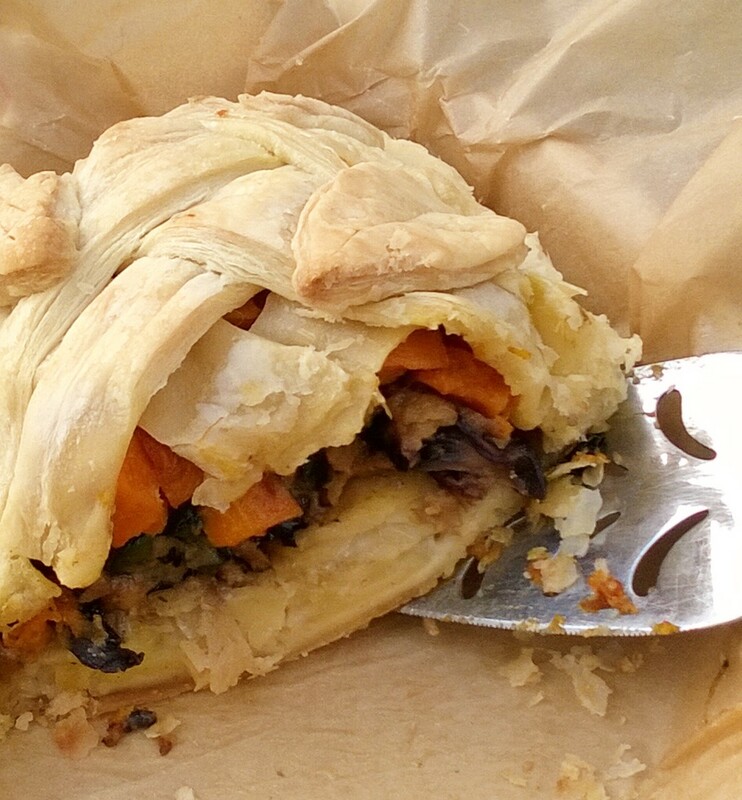 Place the potatoes on the puff pastry, layer with mushrooms, gravy, and squash. Cover the top with the second sheet of puff pastry making sure to seal the edges so everything doesn’t leak. I cut my top sheet into strips and braided it just for fun. Bake the whole thing in a 350 oven until golden brown 40-45 minutes. Serve warm for sure, extra gravy over the top would not be unwelcome.